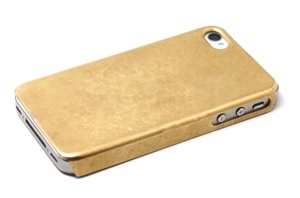 Would You Protect Your iPhone with a $10,000 Solid Gold Case? I’ll admit it: I don’t get the furor over the new gold iPhone 5S. Don’t get me wrong; it’s a great piece of technology. It’s just that something about a fake gold finish doesn’t sit right with me. If I have to carry around a gold phone, I want it to be the real deal. If you want the genuine article too, accessory designer Michael Andrew Saiger has just the thing. Meet the Miansai Solid Gold iPhone Case, a custom-made 14-karat gold accessory for your iPhone that will set you back an eye-popping $10,000. The case itself is absolutely impractical. It leaves large parts of your phone exposed, suggesting its protective powers are minimal. Gold is heavy and malleable, two traits you don’t want in a smartphone case. And nothing says “steal me” quite like ten-thousand dollars worth of gold that easily fits in a thief’s front pocket. Of course, impracticality never stopped the absurdly rich before. According to CBS Marketwatch, though the case was initially designed as a joke, Miansai has actually “sold a handful of cases” to some very well off customers. “Everyone has loved it,” brags Saiger. The Solid Gold iPhone Case is currently available for purchase in your choice of finish and color (rose or yellow gold) at the Miansai website. If you're on a budget, be patient – the company promises that a solid silver iPhone case is on the way.